I recently visited Charleston, South Carolina. While I was there I toured the USS Yorktown, a WWII aircraft carrier, as well the USS Clamagore, a submarine. The USS Yorktown was the 10th aircraft carrier to serve in the United States. It was amazing to see how big this ship was. It really puts it into perspective when you see all the airplanes parked on ship. The submarine was commissioned a few weeks before the end of World War II. It is unbelievable how military personnel could live in such tight quarters for months at a time. It is so narrow in the submarine that you barely have room to walk the hallway. Two people could not pass each other at the same time. While in Charleston, I also went downtown. I ate at Hymans seafood which was delicious! I had lobster bisque, shrimp and grits, fried clams, and lump crab cake. I also tried their hush puppies which were so sweet and delicious. This restaurant has been written up in Southern Living magazine quite a few times as the number one seafood restaurant in Charleston. Many celebrities have eaten there while visiting Charleston. Downtown was very pretty with all the shops lining the streets, and vendors selling their things at the market. Fresh pralines were being made at a candy shop, so of course I had to try them, and ended up purchasing some as well! The weather was beautiful. It was sunny and cool. Wow, the morning couldn't have been more beautiful. 12 people starting a relay race from Miami to Key West! 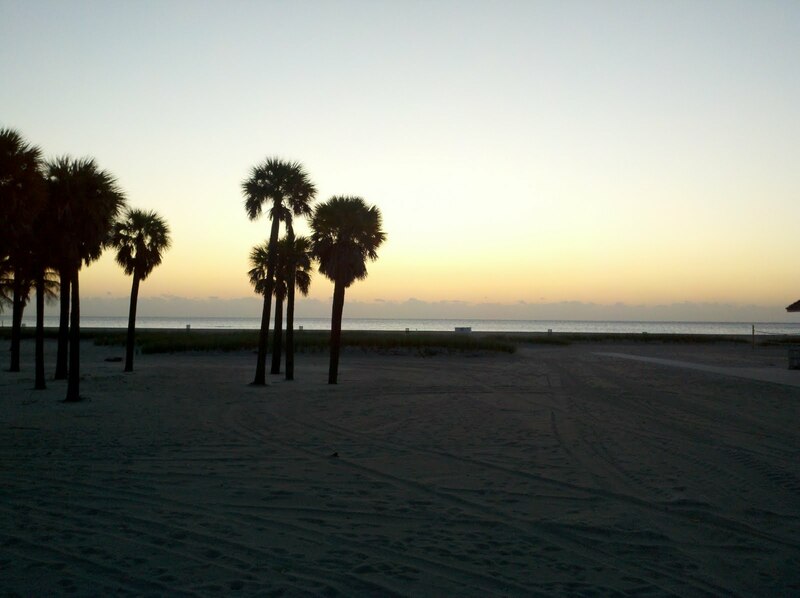 We started at Crandon Park in Miami right on the beach as the sun was rising. It was a cold morning, but the temperatures continued to warm up as the day progressed. The run continued from Miami, through the Everglades, and down US1 until we reached Key West. We did not stop running. The sites were beautiful along the way. Running along the highway and hearing the waves of the ocean, while watching the stars at night was gorgeous. The seven mile bridge was spectacular to look at as well. We ate at a restaurant called Hog Heaven around Key Largo. We had a nice view overlooking the ocean while we ate on their patio. Once we reached Key West, we had a little celebration at the beach. Afterwards, we ate dinner at Blue Heaven. The food was delicious! Again we sat outside and enjoyed the weather while listening to music and eating. Before our drive back to Miami, we enjoyed breakfast at the Banana Cafe. Their food was so fresh and delicious. I can't wait to do this again. I love the Key's! I was fortunate enough to be able to tour the Norwegian Sun and have lunch in the Four Seasons Main Dining Room. We saw inside cabins, ocean view, balcony, and suites! The rooms were nice, especially the suites. There were jacuzzi tubs in the suites along with a sitting area and dining area. One of the suites even had their own jacuzzi on the balcony! The pool area was nice and had a nice buffet going on while we were touring that area. The ship is an older one, and will be going in to dry dock soon for some updates. The children's area was bright and colorful, and the teen area had a nice lounge area for the teens to hang out, along with a foosball and air hockey table. The dining room was nice. We were served an appetizer of beef short ribs, lobster bisque for the soup, rib eye was the main course, and then had a delicious chocolate cake for desert! The meal was very good! They also offered us wine with lunch. The ship was beautifully decorated for Christmas! Sunday 8/29/10 I had the luxury to tour the beautiful Celebrity Solstice ship at the Ft. Lauderdale pier. We were greeted as we entered the ship by their pleasant staff with a mimosa! We were given a tour of the ship, starting with the different staterooms available. We got to see a few different suites (which were amazing). The decor was beautiful, with marble counter tops in the bathrooms and very modern sinks. The staterooms were roomy, so you didn't feel cramped! The balcony rooms had a nice size balcony to sit on while watching the waves go by! After we toured the staterooms, we got to see the different speciality restaurants available, as well as the main dining room. Murano was decorated beautifully, and they served contemporary french cuisine. Silk Harvest was their Asian cuisine, and Tuscan Grille was their Italian steakhouse. They were all so pretty! After seeing the restaurants, we were able to have lunch in the main dining room. Lunch was excellent. We had an appetizer, salad, beef short ribs, and desert. The food was very good, and we all left feeling so full! We then got to finish the tour of the ship. We saw the casino, martini bar, ice bar, and dance club. We also got to see the lawn club. That was amazing. To think that there is real grass growing on a cruise ship! They have lawn mowers and a sprinkler system to keep the grass looking nice. It was a real nice day! Sailing the Southern Caribbean was so much fun. One of the places we visited was Willemstad Curacao. Curacao is part of the Netherland Antilles. They speak Dutch, Spanish, English and their local language, Papiamentu. There is so much to see and do during your visit. The buildings are fun to look at because they are all painted these pastel colors. We took a snorkeling trip and were able to snorkel in the crystal clear waters and see a sunken shipwreck, as well as very colorful fish swimming all around us. On the boat ride to the snorkeling location, we were able to see some of the homes of Curacao, as well as some beautiful waterways. We walked downtown afterwards, and got a chance to see some of the local culture. What a great time we had on Saturday floating down the Itchetucknee River! We traveled to a town called Ft. White in central Florida. When we were just about at the river, we stopped on the side of the road to rent tubes for everyone. After the guy tied them to our truck, we continued on to the river. Once inside, we walked to the south entrance because all the other entrances were closed at that time since they had reached their capacity for the day! Wow the water was cold when we jumped into our tube. As we got acclimated to the water, we started our beautiful float. The water is crystal clear, so you can see below. There are beautiful trees lining the banks of the river, creating canopies of shade the entire trip. Sometimes you could see wildlife hanging out around the banks of the river. Once in a while the kids would stop to jump from a tree branch back into the river. The float took us about an hour to complete. When we were done, we hopped out, enjoyed a picnic lunch and did it all over again. I feel this is one of Florida's most beautiful state parks. Well we just returned from our annual Cocoa Beach trip. As usual, we had a great time. Cocoa Beach is beautiful, and we stay right on the beach. It is so nice to get up in the morning and look out your balcony and see the ocean! This year we rented jet skis and both my children drove them. How exciting! We also went kayaking in the Merritt Island National Wildlife Refuge. That was nice. We got to kayak next to manatee, and also got to touch them. They are very playful, and love to roll over on their backs so you can pet their stomach's. We also got to see dolphin while we were kayaking and jet skiing. Most days were spent on the beach getting sun or surfing the waves! Went to dinner at a restaurant called Fishlips one night. The name is interesting, but the food was good. Of course we had our traditional dinner the first night at Denny's and our traditional breakfast the last day at IHop. Now we are counting down the days until next year! official sweepstakes rules and regulations . your age or home state?